Fine chemical and pharmaceutical companies often employ reactive crystallization or precipitation to make crystalline intermediates and finished products. 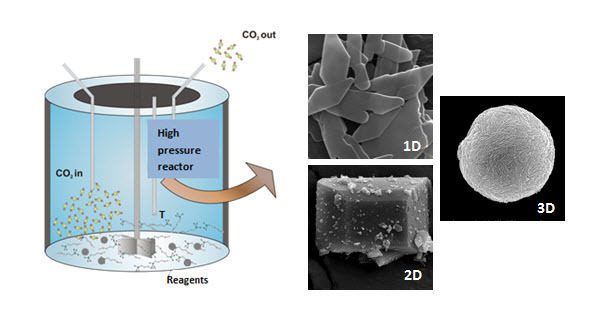 In this work, the supercritical reactive crystallization route is used for the precipitation of diverse metal–organic frameworks (MOFs). 1D and 2D MOFs were obtained by reacting either bypyridil (two linking positions) or triazine (three linking positions)-based bridging molecules, respectively, with supercritical CO2 soluble M(hfacac)2 (where M = Zn2+ or Cu2+ and hfacac– stands for hexafluoroacetylacetonate). Additionally, miscellaneous reactions were designed for the crystallization of 3D MOFs in scCO2, embracing the precipitation of MIL-88B(Fe), ZIF-8, and a new Zn2+–curcumin coordination polymer. Obtained crystals in each case were analyzed from a morphological point of view by scanning electron microscopy analysis to elucidate potential formation mechanisms. The focus was on the obtained crystal habits at different reaction points, linked to the precipitation mode and the role of kinetic and thermodynamic crystal growth control. The supercritical procedure led to the crystallization of stable hierarchical nanostructures with micro- and mesoporosity and the precipitation of nanocrystals.